The most popular aluminium CNC machining center of Tekna on display for you at Fensterbau Frontale Fair 21.-24.3.2018! The latest TKE 944-7 is coming to Finland in May 2018! 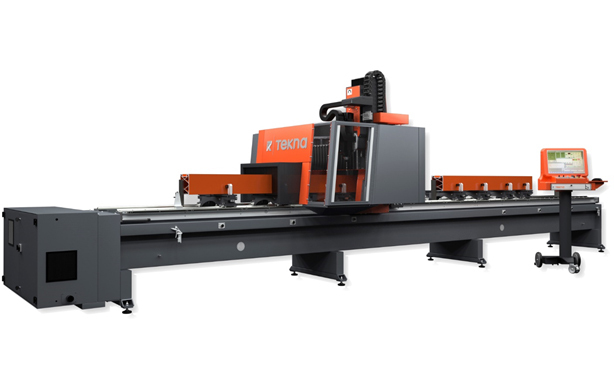 This 4-axis CNC machining center is equipped with largest Y-axis capacity on the market. The machine is available with double clamps which enable double working mode as well as parallel profile machining. Thanks to its unique pneumatic opening cover, the machine can easily be loaded with over 6m workpiece without any extra measures from the operator. Awutek is present at the fair – contact us and discuss how Tekna would improve your production!